Headings make text stand out and help people scan your document. The simplest way to add headings is with heading styles. Using heading styles means you can also quickly build a table of contents, reorganize your document, and reformat its design without having to manually change each heading's text. Select the text you want to use as a heading. On the Home tab, move the pointer over different headings in the Styles gallery. Notice as you pause over each style, your text will change so you can see how it will look in your document. Click the heading style you want to use. If you don't see the style that you want, click the More button to expand the gallery. Tip: You can change the font and formatting of a heading style. Just select the heading text you want to customize, modify its styles the way you want, and then on the Home tab, in the Styles group, right-click the heading style that you customized and click Update Heading to Match Selection. 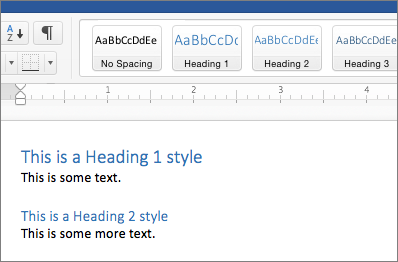 Every time you apply that heading style in your document, the heading style will include your customizations. Styles can do a lot more, including a table of contents. Here's a short video on why to write first and format later using Styles. Headings can make text stand out and help people scan your document. The simplest way to add headings is to use heading styles. On the Home tab, click the heading style you want to use. If you don't see the style you want, click a left, right, or down arrow to see more available styles.